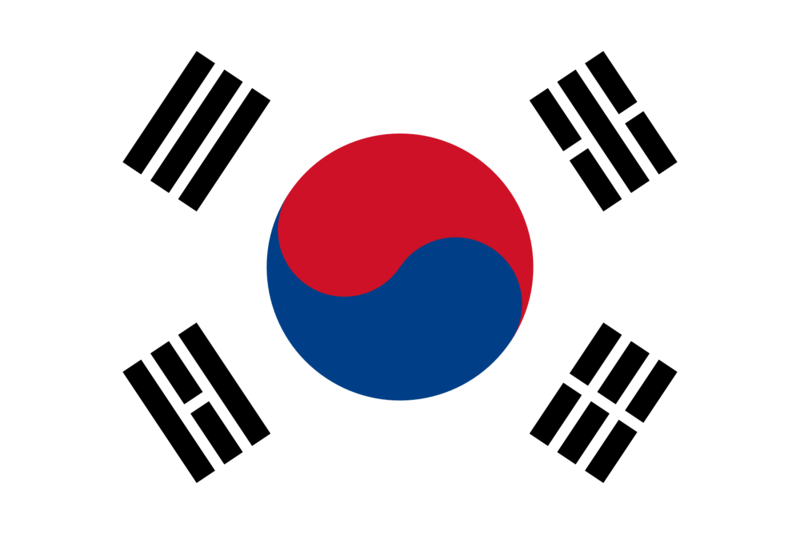 The national flag of South Korea is called “Taegeukgi”. It is white and carries in the center the yin-yang. The yang (red symbol) means light and heat and the yin (blue symbol) represents darkness and cold. The symbols surrounding the yin-yang are four taeguks, which symbolize: sky, water, fire and earth. The white background means peace. The meaning of the national flag of South Korea is based on the Taoist concept of the duality Yin. White background symbolizes peace. In the center is Taegeuk, which represents the origin of all things in the universe, the Great Absolute of Chinese philosophy, composed of the negative aspect or yang (in red), and the positive, or yin (In blue ), both in perfect balance. Together they are in an infinite movement, mixing together and forming a single entity. Around it are four trigrams, called gwae which come from the 8 trigrams of the I Ching (Book of Changes), or Yeok Gyeong in Korean. The Korean national flag, or Taegeukgi, was created and used during the Joseon dynasty. Both the date of creation and the author are still uncertain. It has been said that Pak Yeonghyo was the creator and the first to raise the flag. According to Kim Weon-mo, emeritus professor at Danguk University, the flag in the book could be the same as that used in May 1882 during the signing of the Treaty of Chemulpo between the Cheoson Dynasty and the United States. In March 1883 the Taegeukgi was formally adopted as the Korean national flag. In 1946, after the Japanese occupation of Korea, the last state that embraced the entire peninsula was adopted as the flag of the People’s Republic of Korea.